Denmark has been inhabited for a very long time. There is evidence of human habitation at least as long ago as 12500 BCE, and evidence of agriculture since 3900 BCE. By the time of the Nordic Bronze Age (1800 BCE to 600 BCE), burial mounds began to appear in Denmark. Among the finds from this period are many lurs (a type of horn-like musical instrument), and the Trundholm sun chariot (Danish: Solvognen) - a bronze statue of a horse pulling a large bronze disc. The Iron Age in Denmark is generally divided into three periods: the Pre-Roman Iron Age (approximately 500 BCE to 1 AD), the Roman Iron Age (approximately 1 AD to 400 AD), and the Germanic Iron Age (400 AD to 800 AD). Archaeological evidence shows that native people gradually migrated South, and the first Danish people came to Denmark during the Roman Iron Age (previously Jutland and many Danish islands had been inhabited by Jutes, who in turn later migrated to southern Britain). During the 8th to 10th centuries, people from Scandinavia (Denmark, Sweden, and Norway) were known as the Vikings. 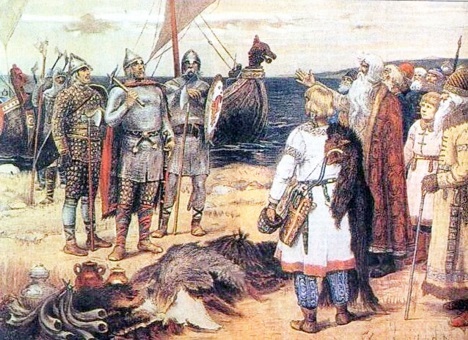 During this period, Viking explorers sailing West reached Iceland, Greenland, and Canada ("Vinland"). Meanwhile, other groups of Vikings explorered, trade with, raided, and settled in many other parts of Europe, and beyond - including conquering parts of England ("Danelaw"), parts of Ireland, and parts of France (Normandy). The Danes were united and Christianized in about 965 by King Harald "Bluetooth" Gormsson (c. 935 to c. 986; King of Denmark c. 958 to c. 986 ; King of Norway c. 970 to 986). Eventually, King Cnut the Great (c 985 to 1035) rules a North Sea empire that included Denmark, Norway, England, and even parts of Sweden. By the high and late Middle Ages, the Danish kingdom included not only Denmark itself, but also Skåneland (a region which is today the three southwestern provinces of Sweden), Danish Estonia, and the Duchies of Schleswig and Holstein (most of which today fall within the German state of Schleswig-Holstein). In 1397, Queen Margaret I became ruler of Denmark, Norway, and Sweden - a personal union, known as the Kalmar Union (Danish/Norwegian/DanishSwedish: Kalmarunionen). The next century plus of Scandinavian history is dominated by the history of the Kalmar Union, with Sweden repeatedly breaking away, and then being reconquered. The Kalmar Union effectively ended in 1523, when the Swedish King Gustav Vasa conquered Stockholm, although Denmark did launch to subsequent attempts, ultimately unsuccessfully, to regain control over Sweden - the Northern Seven Years War (1563 to 1570), and the Kalmar War (1611 to 1613). Following the Kalmar War, King Christian IV of Denmark, using monies collected from a war indemnity paid by Sweden, built several new towns and cities. including Christiania (Oslo) in Norway after the original city of Olso burnt down, Christiansand (today Kristiansand in Norway), Christianstad (today Kristianstad in Sweden) Christianshavn (today a suburb of Copenhagen, and, as a planned rival to Hamburg, Lykstad (today Gl¨ckstadt in Schleswig-Holstein, Germany). Additionally, the Danish East India Company (Danish: Dansk Østindisk Kompagni) was founded, with the intention of establishing trade with India and colonizing Sri Lanka. Ultimately the Danish empire would ultimately consist of a number of small colonies and trading posts on the Indian coast (sold to Britain in 1839 to 1845), the Nicobar Islands (sold to Britain in 1868), a number of trading stations and forts in West Africa known as the "Danish Gold Coast" (sold to Britain in 1850), and the Danish West Indies (sold to the United States in 1917, and today known as the US Virgin Islands), as well Norway (lost to Sweden in 1814), Iceland (an independent ingdom in personal union with Denmark from 1918, and a fully independent republic from 1944), as well as the Faroe Islands, Greenland, and Denmark itself. Denmark had adopted Lutheranism in 1536. There was a brief civil war, the Count's Feud (Danish: : Grevens Fejde), that took place between 1534 and 1536, during this transition, which was to have important consequences later. During the war, Swedish troops were invited into Scania (the southernmost province of Skåneland) at the Danish King's invitation, to surpress his rebellious subjects. However, although the Swedes did hand back the territory to Denmark initially, this whetted Sweden's appetite to conquer the territory, and ultimately they would do so (in 1658). King Christian IV also became involved in the Third Years War (1618 to 1648). During the war, King Christian IV tried to make Denmark leader of the Lutheran states in Germany, but suffered a disastrous defeat at the Battle of Lutter (1626), and was forced to withdraw from the war. Denmark then suffered plague, and series of disastrous military defeats to Sweden - including the loss of Skåneland, Gotland (a Baltic Sea island), Bornholm (another Baltic island), and several provinces of Norway - and narrowly escaped losing its independence completely. Denmark subsequently tried and failed to regain Skåneland in the Scanian War (1675 to 1679), but did manage to regain control parts of Schleswig and Holstein in southern Jutland as a result of the Great Northern War (1700 to 1721). During the Napoleonic Wars, Denmark initially tried to pursue a policy of neutrality between Britain and France, and joined the League of Armed Neutrality alongside Russia, Sweden, and Prussia. The British however considered this to be a hostile act (as members of the League continued to trade with France), and attacked Copenhagen and the Danish fleet in 1801 and 1807. Subsequently, the Denmark-Norway fought a naval war with the British ("The Gunboat War") from 1807 to 1814. As a result of this war, Denmark-Norway went bankrupt in 1813. At the subsequent Treaty of Kiel (1814), Denmark lost Norway to Sweden, and Heligoland (an island in the North Sea) to Britain. Denmark became a constitutional monarchy in 1849, and as mentioned previously sold its colonies in Africa (the Danish Gold Coast) and India to Britain in the 1850s and 1868s. One traumatic event during this period, was the loss of Schleswig and Holstein in 1864, following war with Prussia and Austria in the Second War of Schleswig (Danish: 2. Slesvigske Krig; German: Deutsch-Dänischer Krieg). After the Second War of Schleswig, Denmark adopted a policy of neutrality. It was able to main its neutral status during World War 1. After World War 1, Iceland was granted home rule, and became an independent kingdom in personal union with Denmark. Additionally, following a plebiscite, Northern Schleswig was regained by Denmark from Germany. Immediately prior to World War II, Denmark was still neutral, and had in fact signed a non-aggression pact with Germany in 1939. Nevertheless, German troops invaded and occupied the country on April 9th 1940 after overcoming only minimal military resistance. Until 1943, the occupation was relatively lenient, and there was a degree of cooperation between the Danish government and the German occupiers. However there was an armed resistance movement from 1943 onwards, and additionally, thanks to the efforts of the Danish resistance, the vast majority of Danish Jews survived the war. During World War II, Iceland severed links with Denmark, and Denmark was separated from the Faroe Islands and Greenland (occupied by the British and Americans). After the war, there was a period of constitutional reform - the Faroe Islands gained home rule in 1948 - Greenland became an integral part of Denmark in 1953, and gained home rule in 1979, but was awarded self determination in 2009. Denmark also became a founder member of the European Free Trade Association (EFTA), the United Nations, and NATO (abandoning its previous policy of neutrality). In 1973, after a referendum, Denmark joined the European Economic Community (today known as the European Union). Part reportage, part travelogue, this is a fascinating introduction to contemporary Danish culture for anyone who wants to know more about the world’s happiest nation. Denmark is the country of the moment. Recently named the happiest nation in the world, it’s the home of The Killing and Noma, the world’s best (and most eccentric) restaurant. We wear their sweaters, watch their thrillers, and covet their cool modern design, but how much do we really know about the Danes themselves? Part reportage, part travelogue, How to Be Danish fills in the gaps—an introduction to contemporary Danish culture that spans politics, television, food, architecture, and design. The Ultimate History and Genealogy Collection of Denmark. Make no mistake. This is the most complete collection of Danish History and Genealogy on DVD found anywhere on the Planet at the lowest possible cost. 24- Books on DVD. An essential resource for Genealogists. Scanned images of every page, in Adobe Acrobat Reader PDF format. It's like having the actual book in front of you. Works wit any computer, and is easy to use, read, resize or print from. These books on DVD are SEARCHABLE. What is "Searchable"? Simply type in a word, name, place or phrase and the "Find" function will locate the word wherever it exists within the text. The process only takes a few minutes per book. Saves you hours in searching these books for the information you want. Your Ancestors are waiting to be Discovered. Knud Jespersen traces the historical roots of the modern Danish state and Denmark's international position. This revised, updated and expanded new edition features additional material on issues such as the Danish church, the Enlightenment, cultural history, World War II, current NATO debates and the 2006 "cartoon crisis." One of Scandinavia's most talented young authors follows an eccentric family as they try to cope with the transition of Denmark from medieval society to modern welfare state. By the author of Smilla's Sense of Snow. How did a Danish princess become the so-called first queen of Great Britain? Anne of Holstein is perhaps the least-known Queen Consort in Britain’s history. But her marriage to James I saw her become key to the legacy of the Stuarts. From her homeland of Denmark, Anne travelled to Scotland – a place she had heard tales about of ruthless and bloodthirsty people – and met her betrothed. A teenage Anne was infatuated with her match. They married and bore children, but as the Princess grew to womanhood in the turbulent court of Scotland, she was subject to the unpredictable behaviour of her husband. When Queen Elizabeth I died, James inherited the crown of England and was the first ruler to call himself ‘King of Great Britain’, and Anne the first queen. The Danish Queen tells the story of a woman who crossed the sea and found love and power, but was fated to watch the tragic demise of her children, all of whom were to be haunted by the tragic destiny of the Stuarts. It is a dramatic and enlightening account of the early years and marriage of a queen whose place in history is little known, and is perfect for fans of Anne O’Brien, Elizabeth Chadwick and Alison Weir. Lynda M. Andrews, who also writes as Lyn Andrews, is the Sunday Times Number One bestselling author of over 34 sagas, and one of the top 100 bestselling authors in the UK. She was born and raised in Liverpool, which serves as the inspiration for many of her novels. She now divides her time between Merseyside and the Isle of Man, where she has lived for several years. When she was suddenly given the opportunity of a new life in rural Jutland, journalist and archetypal Londoner Helen Russell discovered a startling statistic: the happiest place on earth isn’t Disneyland, but Denmark, a land often thought of by foreigners as consisting entirely of long dark winters, cured herring, Lego and pastries. What is the secret to their success? Are happy Danes born, or made? Helen decides there is only one way to find out: she will give herself a year, trying to uncover the formula for Danish happiness. From childcare, education, food and interior design (not to mention 'hygge') to SAD, taxes, sexism and an unfortunate predilection for burning witches, The Year of Living Danishly is a funny, poignant record of a journey that shows us where the Danes get it right, where they get it wrong, and how we might just benefit from living a little more Danishly ourselves.